Audi Q7 Review 2019 | What Car? Audi was one of the brands that really popularised four-wheel drive, yet was actually something of a latecomer to the SUV party. It only joined in during 2006, when it launched the original Audi Q7. This second-generation model sticks closely to the template established by the first car, with four-wheel drive that gives it some off-road ability, but more of an emphasis on surefooted and comfortable road driving than traversing muddy fields. It delivers a healthy dose of luxury, and is an extremely practical choice, thanks to a generously proportioned interior with seven seats. 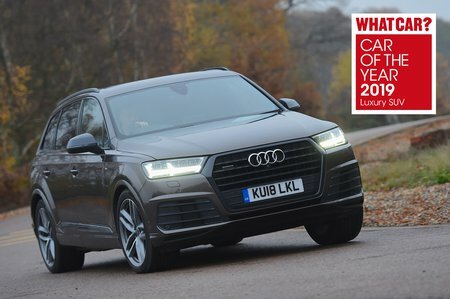 Most buyers choose a diesel, but company car drivers may also be interested in the plug-in hybrid Q7 e-tron, while at the other end of the scale is the V8-powered SQ7 - although neither of these variants are available to order until the facelifted Q7 arrives later in 2019. So, how does the Q7 compare with rivals such as the BMW X5, Land Rover Discovery and Volvo XC90? Read on for everything you need to know, including which engine, trim level and options to choose. And before you buy any version of the Q7, be sure to check out our latest new car deals by clicking here. You might be surprised by how much you could save.